Pennsylvania Gov. 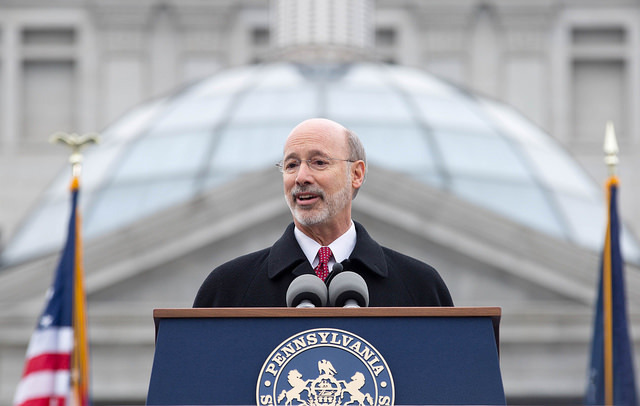 Tom Wolf released his first budget proposal last week, and there were several items of interest related to pensions. On Wednesday, Pension360 covered Wolf’s proposal for issuing $3 billion in pension bonds to attempt to shore up the funding of the state’s two major pension systems. But Wolf is also proposing an overhaul of the systems’ investment strategy. Specifically, Wolf is calling for the systems to take a more passive approach to investing and to cut down the fees it pays to managers. The “commonsense reforms” mean its two state pension plans would have to “seek less costly passive investment approaches where appropriate,” according to the budget. The state has not paid its full pension bill for more than 15 years, the budget document noted. While the proposal was light on specifics for reforming pension investment strategy, the outcome would “significantly reduce taxpayer costs for professional fund managers,” it claimed. The state largest plan, the $52 billion Public School Employees’ Retirement System, already managed roughly a quarter of its assets in-house, as of June 2014. Its portfolio included relatively standard allocations to fee-heavy asset classes, such as private equity (16.3%) and real estate (13.8%). Net-of-fees, the teachers’ pension returned an annualized 10.3% over the last five years. The executive director of the state’s Public School Employees Retirement System defended the fund’s investment strategy in a newspaper piece last year.